Armadillo removal is the key to preventing yard and flowerbed damage. Need a Professional armadillo trapper for armadillo removal from your yard or flowerbed? You need to call a Armadillo Trapper to solve your problem! We can safely and humanly trap armadillo from your property or flowerbed and relocate them far from your yard so they can not return to continue damaging your flower beds or yard. What are other names for Armadillo? “Army Digger”, “Dillo”, “Hoover Hog“, Peba” or “El Armadillo” No matter what you call it, it is one heck of a landscape destroyer and you need an armadillo Trapper FAST! Who can trap an armadillo that is coming in my yard at night? We are the company to call when you need an armadillo trapper in Shreveport & Bossier City! Our methods get rid of the problem critter FAST – No more holes in yards and flowerbeds in areas such as Haughton, Benton and Keithville. Yes, there are tricks of the trade to successfully catching armadillos. It took me a long time to figure these tricks out and using them, I can save you time and money. If you have active armadillo activity in your yard, we can solve your problem FAST! How do you trap an armadillo? What is used for armadillo bait? We use Live traps to capture the armadillo and use a system which utilizes no bait so there are fewer incidental catches such as raccoons, opossum or feral cat when we are targeting armadillo removal from your yard. What is a good armadillo recipe? Do armadillos carry diseases? OK, trick question, you have eaten “Armadillo Eggs” before, right? They are Delicious! Look up the recipe after you call and schedule us to remove your armadillo problem. Although it has been said that armadillo “taste like chicken” I’ve also heard it is the “poor man’s pork” or the “poor man’s pig”. There was a time (or it may still exist) when “Hoover Hog” was table fare for many Americans. What ever the truth really is, I personally can not attest to the taste of an armadillo. Contracting leprosy from handling the armadillo is enough of a chance to take without throwing one on the grill and making “Armadillo on the Half-shell” out of it. As for me, I’ll stick to beef, pork and chicken! What does an armadillo eat? Where do armadillos live? Armadillo removal is one of our many Wildlife Pest Control specialties and many an armadillo have been trapped by us in the Shreveport Bossier City Metropolitan area. Give a crew of Landscape Professionals a carefully devised plan, a wad of your hard-earned cash and a week to accomplish their mission to convert your yard into a awe-inspiring spectacle and an armadillo can turn it all into a pile of dirt and holes in a few nights in search mainly of insects although they do eat some plants, eggs, lizards and other things. You’ll be looking for el exterminador pronto! (I did manage to pass Spanish, but it was a LONG time ago so I’m sure that is incorrect, I hope you’ll understand) We will come when you need us and be there FAST. 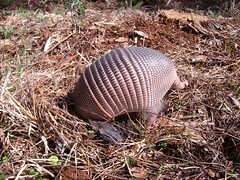 The armadillo can burrow under your foundation, weaken its footing and cause your foundation to CRACK as a result. Even worse, the borrow could case water to run off into it and the dirt that gets eroded away could cause way more than a little crack. Just remember your house’s foundation is sitting on that dirt! Yes, we work on weekends. Need armadillo removal on Saturday or Sunday? No Problem! Can I legally shoot an armadillo on my property? This pair of armadillo were captured together. One was caught coming to the den and one was caught leaving the den. Without special armadillo traps, this would have been a missed opportunity to trap both of them. Common armadillo questions are… How high can an armadillo jump? From what I’ve seen, not very high at all. When startled, they will hop up in the air but I can’t see them jumping over anything much at all. Can an Armadillo climb? Over a hill of dirt, yes. Over a fence, no. What does an armadillo sound like? Although I haven’t studied armadillos in captivity, I can say that out of all the armadillos I’ve captured and release, I’ve never heard one make a single sound. Does an armadillo have teeth? Can an armadillo bite? Not like you and I and not like a dog or cat. An armadillo bite would scare you more than hurt you but “please don’t try this at home”. As my luck would have it that armadillo would have bred with a coyote which would have given that armadillo a giant set of choppers “All the better to eat you with my dear!”. How big is an armadillo egg? really? Ok so… there is this thing called a mammal which, with very few exceptions, give birth to live young. So if you see eggs in your flowerbed, they will defiantly NOT belong to an armadillo. How many babies does an armadillo have? How deep can an armadillo dig? Will a fence keep armadillos out of my yard? Is there a way to keep armadillos out of my yard? How can I keep armadillos from digging under my fence, under my deck, under my house? Well, I have an easy solution to your problem; after we trap and relocate the armadillo, we can install digging barriers! “Digging Barriers?”, you ask; yep, I can install a permanent solution that will end the problem of having armadillos, skunks, or any other critter (including dogs) from digging under whatever you are having a problem with. Call for a product demonstration and recommendation today! Professional Armadillo Removal, Armadillo Management, Armadillo Exterminator, Armadillo Damage to Yard, Armadillo damage to flowerbed, Armadillo poison, Humane Armadillo removal, Armadillo Removal Methods, Armadillo Repellent, Armadillo Removal from my yard, Armadillo Problems in Shreveport.